It has been a while since I have posted anything. I have been working on getting FreeBSD working on my iBook G4 and will be posting on that shortly. I wanted to share my thoughts on running a higher end DE in Linux. Most of my posts have been on PowerPC. These machines are older and are better ran more lightweight DEs such as LXDE, XFCE, or even MATE. Running DEs such as GNOME or KDE really do not make much sense on a G4 machine that the most it can have is 2GB of RAM. However, if you have a more modern machine with good specs then you could go for a more powerful DE. GNOME has been my DE of choice for a while. It is also the DE that my wife really enjoys. One of the features that I really like about GNOME is the keyboard integration. GNOME make it really easy to launch apps and move between workspaces with a few hits on the keyboard. It just has a really clean to look to it. However I have always wanted to try out KDE. So a few days ago a grabbed a Kubuntu 14.04 and 15.04 ISO and went on my way. I was blown away. The first thing that I noticed right about KDE was how beautiful of a DE it is. Everything from the panel layouts, how notifications are displayed, and the look of the application really show that a lot of work has gone into making KDE aesthetically pleasing. It is also one of the most customizable DE I have seen. Some people would say that is way too customizable and I can how you can get lost in all the options. However, for me I it is not an annoyance at all. 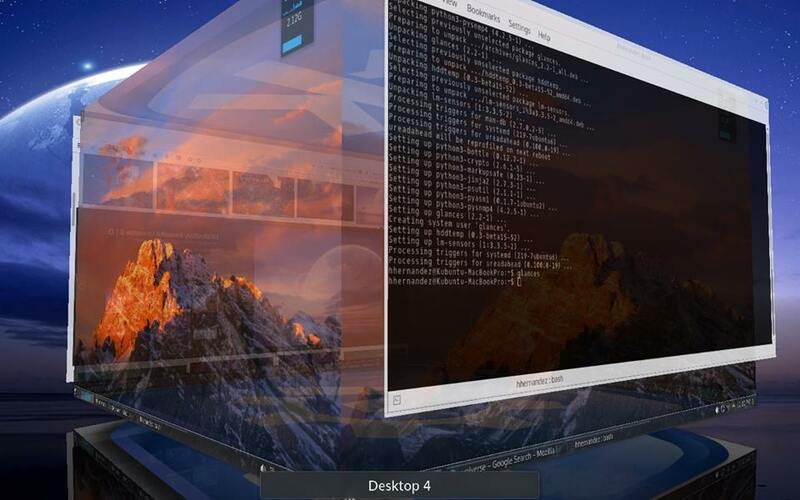 It also has a lot of compiz like features built into its window manager, kwin. If you decide you want to give it a try I would suggest going with Kubuntu 14.04. Normally I would prefer Debian, but the current stable release does not have all the plugins for KDE. So for example I the KDE network-manager applet is not in Jessie so you need to the GNOME applet. If you are using Sid then the plugin is there. I am currently running Kubuntu 15.04 on my 2009 MacBook Pro and even on this older machine KDE runs well. Now 15.04 is running the newer Plasma5 version of KDE. It is still pretty experimental, which is why I recommend the 14.04 version. One drawback I have found with Kubuntu is using Kontact on a Mac that is a little outdated. It is a productivity suite that manages email, contacts, and calendar. It is very resource intensive so I choose not to use to manage my email. If you are running KDE in Debian you can choose not to install this suite if you desired. This is an advantage that Debian has over Kubuntu. However Kubuntu does give you an more straightforward out of the box experience. This may be important if someone does not want to spend time installing packages to get the DE working. Below is a screenshot enjoy!